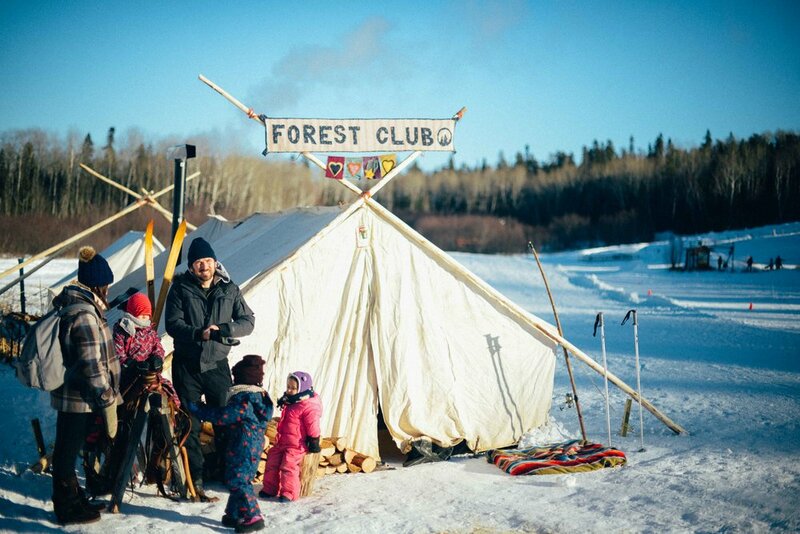 Programming: Falcon Ridge Ski Slopes is excited to host a 2019 Adventure Forest Club. This program is designed to connect children to the lake and forests of Falcon Trails, through safe exploration, play and mentorship. Our programming is focused on outdoor exploratory play and mentorship. The program will run every Saturday, February 2 - March 9, 2019, from 1:30 pm- 3:30 pm for all ages (the program is designed for children ages 5-11, but anyone is welcome to join in on the fun) for 6 weeks. There will be 1 adult for every 6 kids to allow for the opportunity of one on one mentorship. Each week we will explore a new game and skill including (but not limited to) fort building, ice fishing, shelter making, capture the flag, and fire making. The mentors will help facilitate this exploration offering skills, experiences, stories and guidance. An important part of connecting to our land and stories is also about recognizing the historical narrative of the land we are discovering! Falcon Trails recognizes that this event takes place on Treaty 3 territory, more to come about this significance! If you have a child who is younger than 6 or older then 11 please contact us so that we can accomodate and discuss your needs. Feb 2 -Kaylee Youngdahl mentor: Intro to forest school, crafts and play in the forest tent! Feb 16- Ian Young mentor: Ice Fishing catch and eat your own meal! March 2- Brooke Christie mentor: Build a Quinzee how to make a warm winter hideout! Kaylee Youngdahl Kaylee Youngdahl has over ten years experience as a Wilderness guide and educator. She has worked as a hunting guide in the Yukon for seven years and as a wilderness educator and guide in Alberta, BC, and the NWT. She grew up in the boreal forest and is excited to share and explore her wealth of knowledge about local wildlife, fauna, and environmental stewardship. Her passion for children and wilderness exploration makes her an exceptional leader and mentor. She is a Certified Childcare Assistant and is currently studying education at the University of Winnipeg. We are excited to have her on board to be the program leader! Space: The weekly sessions will be held in a unique wall tent located at the Falcon Ridge Ski Slopes. This will be a safe and cozy warm up space. This space will be designed for story telling and indoor activities depending on variable weather. It will be an exciting place for the children to make into their own “forest home”. The Adventure Forest Club is an aspect of the long term vision to expand Falcon Ridge’s involvement in educational outdoor programming. Our Vision is centered around community, environmental stewardship, and connecting to future generations. This project is the first of many exciting events and adventures, fuelled by children’s interest and community involvement. We hope that this program will encourage children and adults to spend more time outside learning to appreciate, explore and love the forests and lakes of Manitoba. Please register today to reserve your spot for a session! Spots fill up fast! We recommend calling in advance to book your spot so that the leaders have an idea of numbers. We would also like to encourage drop ins if you are at the ski hill for the day and have not heard of the program. Please contact me for further resources, and questions!